The Freckleton Air Disaster occurred on 23 August 1944, when a Consolidated B-24 Liberator of the United States Army Air Forces (USAAF) came down in bad weather into the centre of the village of Freckleton, Lancashire, England. The aircraft crashed into the Holy Trinity Church of England School, demolishing three houses and the Sad Sack Snack Bar. The death toll was 61, including 38 children. Two newly refurbished B-24 heavy bombers, being made ready for delivery to the 2nd Combat Division, departed USAAF Base Air Depot 2 at Warton Aerodrome on a test flight at 10.30 am. Due to an approaching violent storm, both were recalled. By the time they had returned to the vicinity of the aerodrome, however, the wind and rain had significantly reduced visibility. On approach from the west, towards runway 08, and in formation with the second aircraft, the pilot of Consolidated B-24H Liberator named “Classy Chassis II” reported to the control tower that he was aborting landing at the last moment and would perform a go-around. Shortly afterwards, and out of sight of the second aircraft, the aircraft hit the village of Freckleton, just east of the airfield. In the school, 38 school children and six adults were killed. The clock in one classroom stopped at 10.47 am. In the Sad Sack Snack Bar, which catered specifically for American servicemen from the airbase, 14 were killed: seven Americans, four Royal Air Force airmen and three civilians. The three crew on the B-24 were also killed. Practically every family and organisation in the village were affected by the tragedy in one way or another, with members of the band being no exception. The links to the fateful day are still with us today with retired players having lost siblings in the school. Harry Latham, an evacuee to Freckleton as a four year old boy was a survivor of the accident and over subsequent years played a tremendous part as a supporter, fundraiser and as Vice Chairman of Freckleton Band. It will be the second anniversary of his death on the 30th August this year, and is sadly missed by us all. Our current Chairman and longest-serving current member of the band, Mark Rossall’s sister-in-law Nelly was a survivor, however, her five year old sister Dorothy died on her first day at school. The village will be holding a memorial service at 10:30 on 23rd August 2014 exactly 70 years after the disaster in the Church of England churchyard. 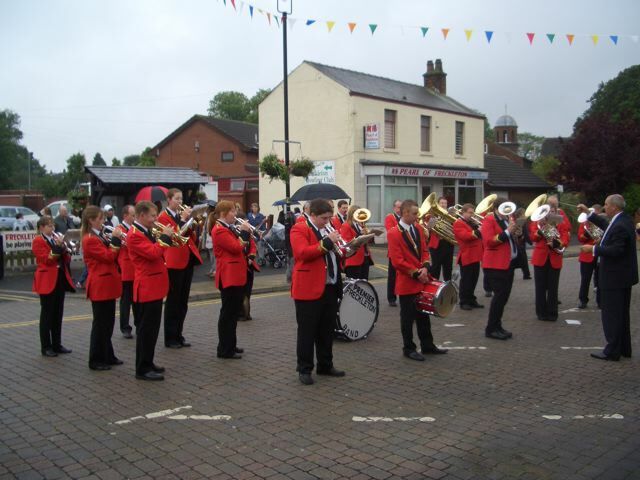 Freckleton Band will be playing before and throughout the service. This entry was posted in Brass Band, Freckleton and tagged #Freck70, 70th Anniversary, BAD2, Freckleton Air Disaster, Harry Latham by grumbal. Bookmark the permalink.